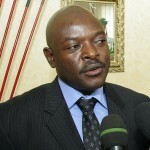 Demonstrators took to the streets of Bujumbura following a decision by the ruling National Council for the Defense of Democracy – Forces for the Defense of Democracy (CNDD-FDD) to nominate incumbent president, Pierre Nkurunziza, as its sole presidential candidate for the upcoming polls scheduled for June 26. The attempt to stay on for a third term is controversial as it violates the two-term limit stipulated in the 2000 Arusha Peace and Reconciliation Agreement, which established Burundi’s political transition from civil war, its constitutional framework, and the country’s current system of government. The Agreement also provided a framework for the formation of Burundi’s nascent multi-ethnic state-building process, which has held the country together after decades of repeated cycles of violence, including genocide, between its two dominant groups, Hutus and Tutsis. 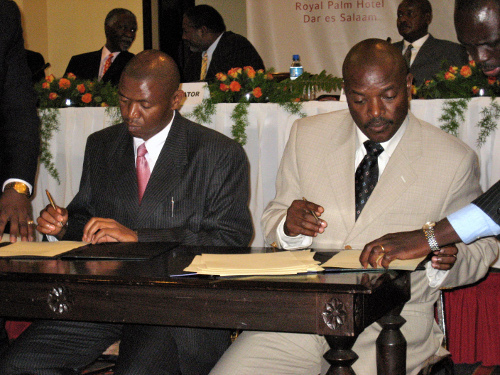 President Nkurunziza and FNL leader Agathon Rwasa sign the 2005 peace accord. Photo: UN/Penangnini Toure. All this is now at risk of unraveling. Accusing the media of encouraging an “uprising,” the government has banned seven popular radio stations, restricted social media, and arrested some 100 protestors, including several human rights activists. At least 15 people have been killed. Still, demonstrators are vowing to press on with protests. Tanzania’s President, Jakaya Kikwete, has warned the country’s leaders that they risked civil strife if they failed to abide by the Arusha Agreement. 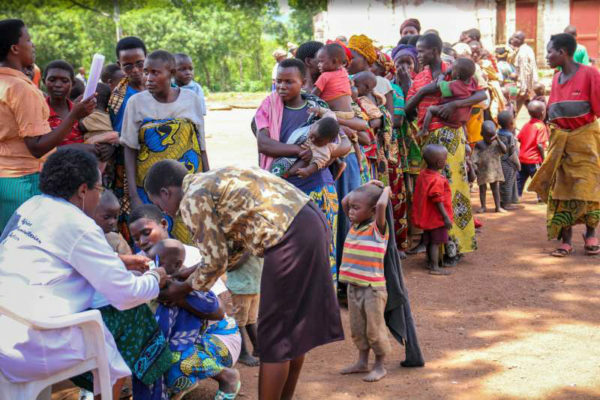 This crisis is part of a larger struggle by Burundi’s multi-ethnic civil society to preserve democratic space and expand the gains Burundi has made since 2005 to create a more inclusive society. Civil society organizations are demanding that the Arusha provisions should be respected. Weeks before the controversial decision, civil society members had warned that they would demonstrate until President Nkurunziza stepped aside. The CNDD-FDD, on the other hand, has argued that Nkurunziza’s first term does not count because he was elected by parliament and not by popular vote. The stand-off spilled into the open in early 2014 when Burundi’s largest civil society grouping, the Forum for the Strengthening of Civil Society (FORSC), a coalition of more than 200 member organizations, worked with opposition lawmakers to defeat the ruling party’s attempt to change the constitution to allow the president to contest a third term. The same coalition blocked the government’s attempt to put the matter to a referendum after it had been defeated in parliament. With these two avenues closed to it, the CNDD-FDD has been left to justify the fielding of the President as its sole candidate – but not before losing several of its own high-ranking members who had urged their leader to refrain from seeking a third term and were dismissed as a result. The influential Burundi Conference of Catholic Bishops, similarly, issued a rare statement calling the President’s third term bid unconstitutional. 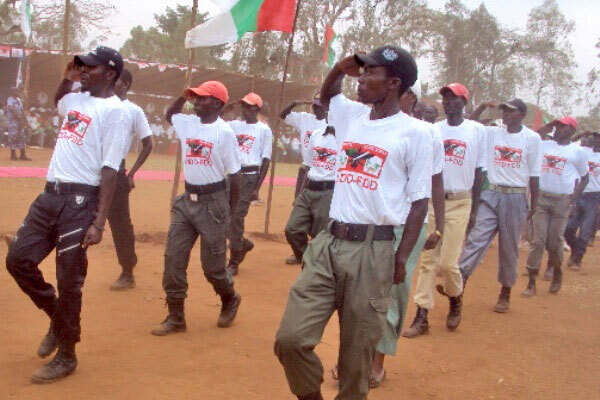 The youth wing of Burundi’s ruling CNDD-FDD, known as the Imbonerakure. Photo: IRIN/Desire Nimubona. Many are worried about whether Burundi’s multi-ethnic experiment is resilient enough to withstand the current crisis. Until now the power-sharing formulae provided in the Arusha Agreement were the basis for the structure and composition of all branches of government. With the collapse of CNDD-FDD’s ruling coalition, civil society is likely to face significant strains to maintain its multi-ethnic character. So far, they have succeeded with members from Hutu and Tutsi neighborhoods participating in protests. This builds on a legacy from the latter stages of the Arusha peace negotiations when civil society first began to function across ethnic lines – unlike the political parties and rebel groups, which negotiated as ‘ethnic blocs.’ Because of this recent history, civil society leaders will likely have a major role to play in maintaining stability and ensuring that the vision for an inclusive society remains alive beyond the current crisis. Photo: US Army Africa/Rick Scavetta. The army is the other institution that all Burundians are expectantly watching. Much was achieved by Burundi’s Security Sector Development Program (SSD) in terms of addressing reform at the policy and operational levels and in laying the foundations for a new and inclusive service culture. These gains, however, will likely be tested if ethnic differences become crystallized in a prolonged crisis. So far the army appears to be protecting protestors and is staying away from conducting anti-riot duties. 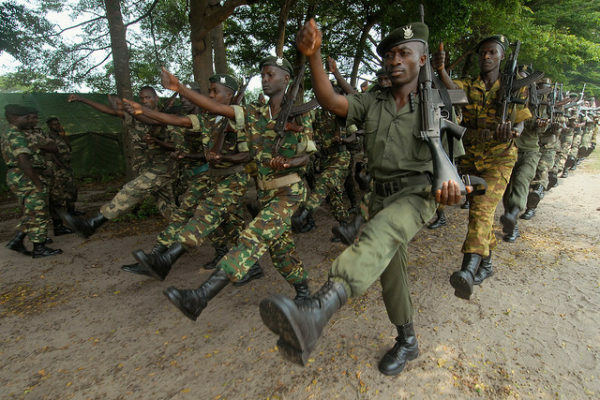 Minister of Defense Pontien Gaciyubwenge has announced that the army will remain neutral. Nevertheless, it has been put in an awkward position, having been deployed into a highly charged and potentially divisive political crisis. This position is further complicated by the perception that the police and gendarmerie as well as the Imbonerakure are sympathetic to the CNDD-FDD. Over 12,000 Burundians have fled to Rwanda and the Democratic Republic of Congo between March and April 2015. Photo: UNHCR/S. Masengesho. Burundi’s neighbors and the wider region also have responsibilities for mitigating the crisis. Tanzania was the architect of the Arusha Agreement, while South Africa played host to the ceasefire negotiations and subsequent agreements. Both countries, arguably, have a vested interest in facilitating a peaceful transition. Uganda, Rwanda, Kenya, and Tanzania, have acted as ‘guarantors’ to the process and, working together with the African Union, are well-positioned to lead preventive diplomacy efforts. Rwanda’s role cannot be ignored given that it shares the same ethnic composition as Burundi and its historical lessons are culturally resonant. Burundi’s neighbors and the broader international community, consequently, are influential actors in shaping the governance norms and standards that will define Burundi’s prospects for democracy, constitutionalism, and the rule of law. Burundi’s greatest promise lay in its attempt to move away from the exclusionary practices of its tragic past and model a new society. Ethnicity, in itself, was never the problem: Hutu, Tutsi, and their kinsmen the Twa, all share the same language and culture. Rather, it is the political manipulation of their differences in identity that has led to extreme inter-group conflicts and ultimately genocide. Fifteen years after the signing of the Arusha Agreement the country is once again at a crossroads between peace and violence. How leadership is exercised, especially among civil society, political elites, and the military, will determine whether Burundi’s tragic past remains firmly behind it. Howard Wolpe, “Making Peace After Genocide: Anatomy of the Burundi Peace Process,” United States Institute of Peace, 2011. Kelsey Lilley, “Burundi’s President Set to Defy Term Limits, Upset Delicate Peace,” The Atlantic Council, April 23, 2015. 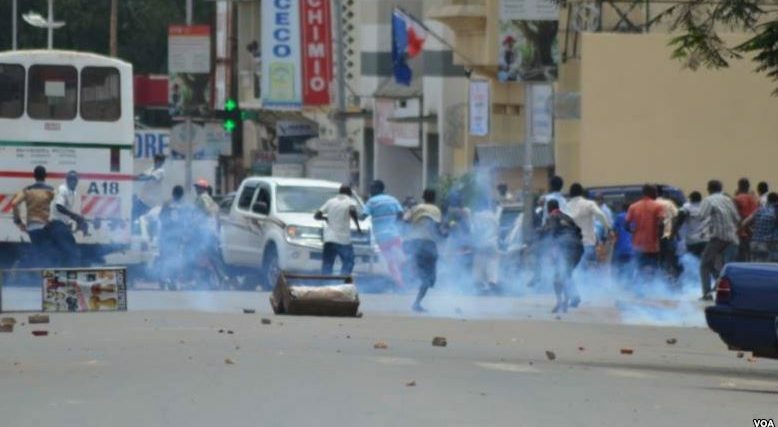 “Burundi: Bye Bye Arusha?” International Crisis Group, Africa Report No. 192, October 25, 2012. Adonia Ayebare, “Peacemaking in Burundi: A Case Study of Regional Diplomacy Backed By International Peacekeeping and Peacebuilding” International Coalition for the Responsibility to Protect, 2011. Ignatius Ssuna, “Thousands of Burundians Flee and Election Tensions Rise,” IRIN Humanitarian News and Analysis, April 14, 2015. Clement Mweyang Aapengnuo, “Misinterpreting Ethnic Conflicts in Africa,” Africa Center for Strategic Studies, Africa Security Brief No. 4, April 2010.